So, Winter Soldier is getting his own book. But, let’s keep the book being more about Bucky and everyone BUT Captain America, Steve Rogers. At least in this sense, we get to see what happened to Bucky II, Fred Davis, who teamed with the Spirit of ’76 to become the 2nd team of Cap and Bucky when Cap disappeared. Davis lasted as Bucky until getting shot, I believe, in service to the 3rd Cap, aka the Patriot. With plotting like this disguised as homage and such, Marvel needs to be the House of Recycled Ideas. The only thing Marvel has going for it is no Jim Lee and no Rob Liefeld. Brubaker and Co. seem to be phoning it in more and more as far as creativity. This storyline takes from the whole death of Cap II story involving the android Adam II and how he almost substituted a doppelganger for Jack Kennedy in the 40s. Fred Davis, now a geriatric, is visited by Steve Rogers when danger happens. It appears it is all tied to the Adam II case. We even find out the Spirit of 76 had a kid he didn’t know about, which makes Fred feel guiltier. We get the son of the Spirit of 76, Real Cap, and the original android Human Torch back together to go investigating. It looks like yet another Invaders reunion. Normally I would be all for this, but the effort is barely there in the story. The tease for next issue doesn’t add much: Bucky Gone Bad….or issue 627…Cap vs. Cap Hating Androids…Been there…done that. The art is ok, as this book really misses the coloring of Bettie Breitweiser. Truly the art is hit and miss with Francavilla. One picture it looks classic war era Cap, the next it looks like Peanuts. Not great consistency. I don’t mind WWII tales. Heck, even tales when Steve was frozen I wouldn’t mind. 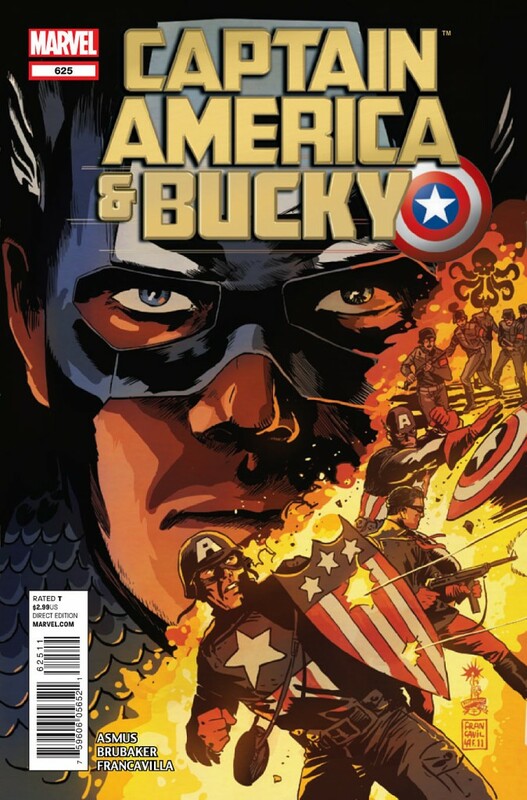 But again, this book is CAPTAIN AMERICA & Bucky, not BUCKY and Cap. Inconsistent art and lack of effort in writing move this one further down my pull list. If it wasn’t for my undying loyalty to Cap, I would have abandoned it when Breitweiser left.